During my conversation last week with Mr. Huang (黃崇典), Taichung City Director of Urban Development, a key topic of discussion was Taichung’s transportation system. Taichung has the highest per capita car ownership out of Taiwan’s large cities and insufficient public transportation infrastructure. Construction of Taichung's mass rapid transit (MRT) system has been a contentious issue due to high costs (the first line alone will cost over $51 billion TWD or $1.67 billion USD). Director Huang confirmed that construction on Taichung’s first MRT line has begun and operations are scheduled to commence in four years. The second line to be built will most likely be the blue line, running along Taichung Harbor Road (台中港路) into the city center. However, construction on the blue line hasn’t broken ground, and four other lines are still in their planning stages. It appears that final completion of Taichung’s metro system is still years, if not decades away. As an alternative method of traffic alleviation and carbon emission reduction, Director Huang mentioned the development of Bus Rapid Transit (BRT) in Taichung, citing the example of Curitiba, Brazil, the model of BRT systems internationally. In this post, I want to examine the concept of BRT, explore how a few cities have adapted its principles to fit their specific transportation needs, and evaluate its future potential in Taichung. BRT's major advantages are its low upfront cost and flexibility. Cost is a major factor in determining a city's options in improving its public transportation system. Underground MRT systems cost between $45 million and $320 million USD per kilometer. Taipei's MRT system is generally hailed as a success, but its costs will exceed $30 billion USD upon completion of its second phase. A cheaper option is light rail transit (LRT), featuring above ground electric rail cars and ranging in price from $30 million to $100 million USD per kilometer. BRT systems are cheaper than both LRT and MRT options, with costs varying between $500,000 to $15 million USD per kilometer. Although many city-specific factors determine the precise cost of each option, BRT's substantially lower investment price offers cities lacking upfront capital an alternative to inaction. Another appealing quality of BRT systems is their flexibility. BRT can comprise a city's entire public transportation network, supplement/feed-into existing metro systems, or be converted to rail transportation at a later date. The negative stigma of existing bus systems is a formidable barrier to overcome in selling the BRT concept. In most parts of the world, the words “public transport” have the same connotation as some other public goods such as “public restrooms”. Thus, public transport is something that is not clean and not particularly nice, and should only be endured when truly necessary. In addition to the stigma associated with bus travel, there are legitimate concerns regarding overcrowding, pollution, and labor productivity. Any reference to BRT development will likely cite the Brazilian city of Curitiba*, the birthplace of modern BRT systems. Faced with a lack of funding for a metro system, rapidly expanding urban area and increasing reliance on private cars for transportation, Curitiba implemented the world’s first BRT system in 1974. Under the guidance of Curitiba architect and Mayor Jaime Lerner, the city’s BRT network has expanded into a comprehensive and popular form of urban transportation. 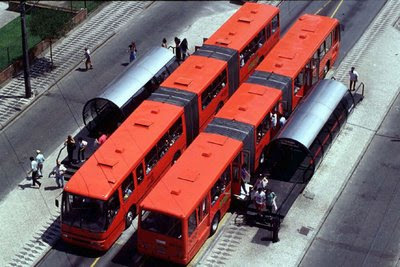 Curitiba utilizes what many now consider to be staples of a high-level BRT system including: exclusive busways, prepayment, free transfers, alternative fuel vehicles, same-level boarding, and quality stations. Curitiba's BRT system continues to modernize and develop. Its latest green line added 9.4 km of BRT expansion while integrating green space and bicycle paths along the route's axis. Despite the successes of Curitiba's BRT system, discussions are still ongoing regarding the construction of an MRT system. Issues such as rapid urban development at Curitiba's periphery, increasing car ownership, and image for the 2014 influx of World Cup tourists still color the debate. Taipei is the home of Taiwan's first BRT system, beginning operation in 1996 and running as a supplement to its MRT system. In contrast to the Taipei MRT's astronomical price tag (one of the most expensive in the world), the 57 kilometers of Taipei BRT cost a modest $500,000 USD per kilometer. Taipei utilizes exclusive bus lanes (although not segregated physically from traffic), digital payment cards, and feeder service to MRT stations. Taipei's BRT has been a measured success, and bus lanes have increased average speeds for both busses and private vehicles. Taipei has also begun to integrate alternative fuel busses into its fleet. Taipei City has offered subsidies to its bus companies to encourage purchasing hybrid busses, and 75 electric-diesel hybrids are now in operation. Xiamen, the TSCCI project’s mainland sister eco-city to Taichung, has implemented one of China’s most successful and comprehensive BRT systems. Xiamen had long looked to alleviate traffic congestion through improved public transportation. 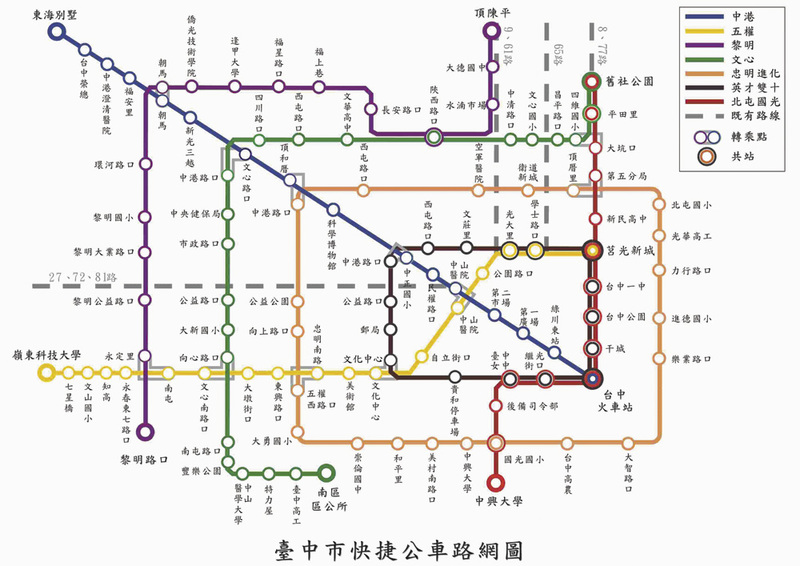 By its own calculation, every kilometer of subway line would cost the city 500-600 million yuan, ($73-88 million USD) and a light rail would cost 150-200 million yuan ($22-29 million USD). Instead Xiamen embraced a cheaper option and BRT has become the city's main mode of public transportation. Xiamen’s BRT system began operation in September 2008. With its ease of use and ticket prices below 1 yuan, rides have increased to 22 million/day. In a January 2009 WRI Center for Sustainable Transport report, Xiamen's BRT system received the second highest evaluation out of thirteen Asian cities (Taipei tied for 10th place). The efficiency of Xiamen's BRT system has played a major role in Xiamen's status as China's top city in transportation convenience for six years running. The Xiamen BRT relies on five lines and a supplementary series of shuttle busses that connect to BRT stations. The BRT links downtown Xiamen Island to the outlying areas of the city, achieving the same effect as an MRT in developing adjacent communities through greater public transportation access at a fraction of the cost. 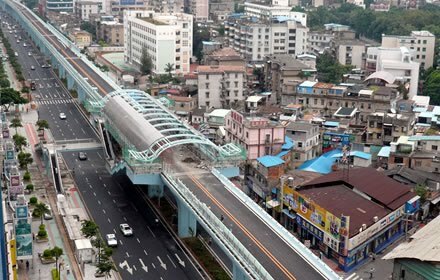 Xiamen’s BRT system not only utilizes specialized bus lanes, but also includes its own elevated network of roadways (China’s first elevated BRT network). As a result of its designated BRT highways, Xiamen’s buses can reach speeds of 60 km/hr. Xiamen has also utilized its BRT system as to showcase its green efforts: 300 compressed natural gas (CNG) busses were purchased in March 2010 as part of a larger plan convert 40-50% of Xiamen’s bus fleet to CNG busses by 2015. Additionally, Xiamen is integrating renewable energy into its BRT stations as it launched China’s first solar powered BRT station in May 2010. Despite the successes of Xiamen's BRT system, the city is continuing with plans to develop a network of public rail transportation. The city has announced that construction of the Xiamen Urban Rail Transit program will begin in 2011. Underground rail is planned for the city center and above surface stations outside Xiamen Island. The future of Xiamen's BRT is uncertain; it may continue to operate connected to light rail and metro networks, although there is an ongoing movement to convert the BRT to an LRT system. Irregardless of whether Xiamen's BRT system will serve as a bridge or supplement to a future MRT system, it has effectively garnered widespread public approval and utilization, and potentially laid the infrastructural groundwork for more expensive and advanced transportation systems. Taichung has recently taken steps to enhance its frequently maligned public bus system. While stations along Taichung’s busy thoroughfare Taichung Harbor Road (台中港路) do not have boarding platforms, many offer shelter, seating, and real time digital tracking of bus arrivals. Taichung is transitioning to electronic fare payment and is in the process of outfitting all its city busses with GPS, allowing potential riders to track bus locations on their computers and mobile phones. 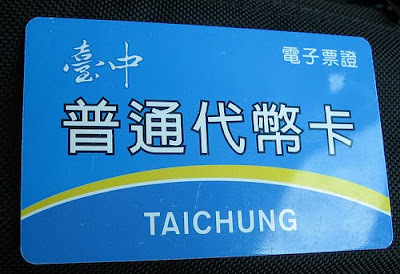 In May 2009, Taichung launched the Taichung Traffic Jam (TTJ) bus service. The TTJ bus features seven new express lines (some mirroring Taichung's future planned MRT lines) that stop at key areas of the city. Through its interconnected route network, exclusive use of automated pay-cards, and express routes, the TTJ busses are a positive attempt to increase the efficiency of Taichung's bus system. Furthermore, all rides on the TTJ busses were free for the first six months of operation, a measure aimed at increasing Taichung citizens' ridership. The TTJ busses are a good, but small, step towards creating an efficient BRT system in Taichung. Taichung’s bus system still lacks many hallmarks of a quality BRT network such as widespread usage of special bus lanes and prepaid boarding. 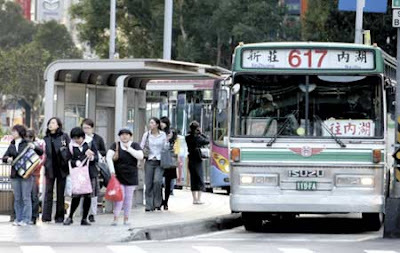 Perhaps equally important to upgrading its busses, stations and routes is the need to change the negative perception of the bus system in Taichung. When speaking to many people in Taichung about the busses, reactions range from puzzlement to disdain. Most people conclude that a scooter or car is essential to life. Without first working to increase public awareness and usage of public transportation options, Taichung could face problems akin to Kaohsiung City's once its MRT comes online later this decade. I believe that a comprehensive BRT system in Taichung is a good fit as its low upfront investment cost presents a good risk/reward ratio to Taichung's City government. While the soaring BRT-exclusive highways of Xiamen aren't likely to materialize in Taichung, measured steps to upgrade the city's busses, stations, lanes, and marketing of its BRT system are pragmatic and cost-effective options to stimulate increased ridership. Paramount among Taichung's BRT challenges is to reverse the negative image of Taichung's bus system. GPS tracking and free express busses are a good beginning. Taichung still needs more exclusive bus lanes and enclosed stations with prepayment, giving its bus system a more sophisticated and integrated feel. Although the public perception of Taichung's public transportation system is largely negative, the city's parallels to Curitiba offer room for optimism. Both cities underwent rapid urbanization and expansion which necessitated a re-think regarding their urban planning models. Both Taichung and Curitiba coveted underground metro systems, but a lack of funding prevented them from rapidly developing a subterranean public transit option. As of 2004, Taichung's high levels of private car ownership (276 vehicles/1000 people) were still less than Curitiba's rate (333 vehicles/1000 people), indicating that public and private transportation options can co-exist. When examining successful BRT systems worldwide, it seems that no city's public transportation system is complete (in the opinion of its planners) without some form of public rail transportation. It easy to get lost in a debate over which form of public transportation is best while small, practical changes are delayed. In this respect, Taichung is ahead of the curve. The city has already begun construction on its long-awaited MRT system and can now focus on developing a low-cost BRT network to supplement it. Similarly to Taipei, Taichung can utilize its BRT system to connect areas of the city that will lack access to its new MRT. The years between now and the planned opening of the Taichung MRT mid-decade present Taichung City with an important opportunity to lay the groundwork for a culture of public transportation usage at minimal cost and risk. If the city fails to act however, Taichung's citizens may continue to prefer scooter over subway. Despite efforts over the years to revive Taichung's old Central District, the city's urban core remains in a state of rapid decline. In contrast to the stagnation of the old city center, development in Taichung's new Zone Seven is booming. In the August 2010 article One Taichung, Two Worlds, Commonwealth Magazine (天下雜誌) provides excellent context on Taichung’s urban decay and expansion issues. “Taichung's overnight urban expansion has been intense. Prior to the tenure of Mayor Tseng Wen-po in 1981, municipal Taichung occupied just 57.4 hectares. However, after eight urban development programs under Tseng and successor Lin Po-jung, the city expanded by 1754.2 hectares, growing 30 times over. From retaining a considerable amount of agricultural land, Taichung suddenly turned into a concrete jungle." Lastly, the article also highlights the difficulty in reversing the trend of urbanization. Taichung's simultaneous urban decay and sprawl should be a familiar narrative to many cities in the developed world. Taichung will face serious challenges to rejuvenate its central district and alter its course to a sustainable path of urban development. More to come on this issue soon. In this post, I would like to provide a bit of general background information on eco-cities, the Taiwan Strait Climate Change Incubator (TSCCI) project, and the Energy Masterplan for Taichung City. Eco-cities are largely conceived in two forms. Many current eco-city projects, such as the Masdar eco-city in Abu Dhabi or the Sino-Singapore eco-city in Tianjin, are new cities created from scratch. There are also eco-city projects that retrofit existing cities. While the former gives wider latitude to its planners, the latter presents further challenges but is ultimately more applicable to the needs of the world’s industrialized metropolitan areas. What is the TSCCI Project? The Taiwan Strait Climate Change Incubator (TSCCI) project incorporates eco-city proposals for the cities of Taichung, ROC and Xiamen, PRC. The TSCCI project was created by CHORA Architecture and Urbanism founder Raoul Bunschoten, who has worked with partners in Xiamen and Taichung on energy master plans for both cities. While each city has its own distinct strategic plan, there is a planned carbon-trading system that will link the two urban centers across the strait. Later this year, I will have an opportunity to go to Xiamen to examine its eco-city proposal and progress, but for now my focus will be on Taichung. Taichung is an interesting eco-city candidate because of the familiarity of the challenges it faces. Like many cities in the developed world, Taichung is confronted with traffic congestion, infrastructural insufficiency, and urban decay. Additionally, Taichung's districting situation adds a further dimension of influence to the urban development policies it adopts. 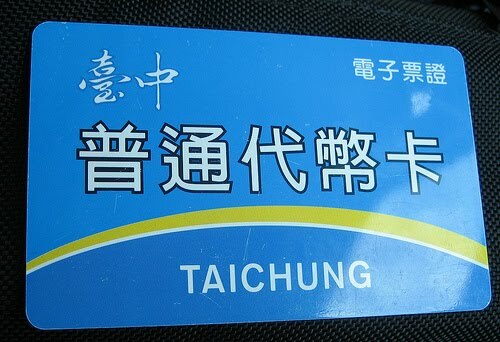 By the end of 2010, Taichung City will merge with Taichung County, consolidating into one municipality. Thus, urban planning for Taichung will soon encompass a broader area, creating additional opportunities to carry out sustainable urban development projects. Taichung has already taken steps to become a greener city. Taichung Mayor Jason Hu has emphasized carbon reduction and at the 2007 Bali Conference, Taichung (along with Taipei and Kaohsiung) agreed to reduce greenhouse gas emissions to 60% below 1990 levels by 2050. With its planned new convention center and metropolitan opera house, Taichung is constructing landmark green buildings that will convey its status as a sustainable city. The proposal outlines specific green development plans for all areas except the Fazi River and Old Taichung City Hall. So far, only the re-development of the Shui-nan airport area has begun. Although CHORA and Tung Hai University’s proposal for Shui-nan airport's revitalization was not adopted by the Taichung government, its recommendations heavily influenced the energy efficiency and renewable energy components of the final proposal that was commissioned. Over the course of the year, I will examine the various districts of Taichung and their green urban development initiatives in more detail. When applicable, I will draw parallels to green development in Taiwan's other cities and their potential transferability to other international cities. Over the upcoming year, this blog will serve as an outlet for my Fulbright research on Taiwan’s green energy sector. I am based at Tung Hai University in Taichung where I will be examining the Taiwan Strait Climate Change Incubator (TSCCI) project’s impact on Taichung City. The TSCCI project is a cross-strait partnership between Taichung, ROC and Xiamen, PRC that endeavors to create eco-cities in both urban areas and further cross-strait economic and cultural exchange. Although the TSCCI eco-city proposal for Taichung (co-drafted by the Tung Hai University Department of Architecture) is my main research focus, I will use its recommendations and the issues it raises as a vehicle to explore Taiwan’s pathway towards sustainable cities. While China currently garners much of the world’s attention in regards to East Asian energy development, a deeper examination and understanding of Taiwan’s energy policy and urban development may be more instructive for the West. In contrast to the exponentially growing metropolises of China, Taiwan’s cities are already built and their populations relatively stable. Thus, like many older cities in the U.S. and Europe, Taiwan’s urban areas require precise sustainability retrofits, not construction of entirely new metro areas. Taiwan also enjoys a vibrant democracy and free press. Thus, the fusion of electoral politics and the media (as in the U.S.) are a major factor in determining Taiwan’s ability to enact energy legislation and transition to a green economy. Taiwan’s current level of dependence on imported fossil fuel is unsustainable. However, Taiwan already possesses advantages that lend themselves to exact rapid and lasting change. Taiwan has excellent human capital, academic institutions, business infrastructure and entrepreneurship, and technical innovation. The government has also recently passed energy legislation calling for the creation of pilot eco-cities and directed funding to stimulate targeted sectors of green industry. I believe that a closer examination of how Taiwan greens its cities will identify solutions that can be adapted to first-world cities globally. I hope that this blog will be a resource for those interested in Taiwan’s eco-city development, green energy policy, cross-strait energy cooperation, and scalable solutions to green urban areas internationally.